Scrambled eggs are a popular breakfast staple, but one that can often go painfully wrong. 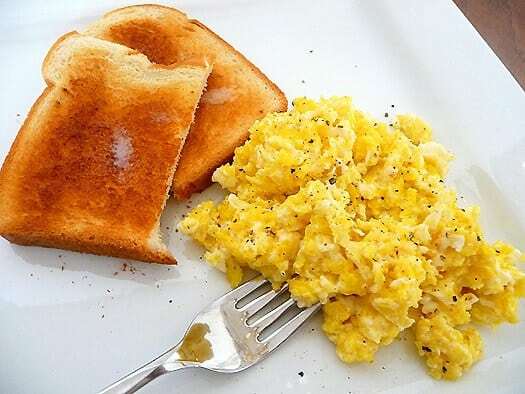 Sure, it’s pretty hard to make scrambled eggs inedible, but there’s nothing worse that rubbery scrambled eggs, or ones that are still quite watery. Once you master perfectly fluffy and moist scrambled eggs, there will be no turning back. 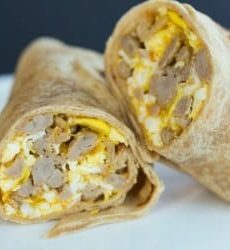 It’s so simple and combines a few “secret” methods that together produce some of the most delicious scrambled eggs that will ever pass your lips. Weekend breakfasts will never be the same! Now what are you waiting for? 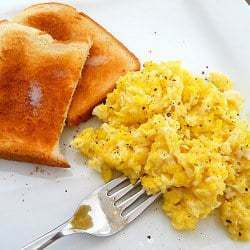 Grab some eggs and practice your scrambling! I typically like to use a non-stick skillet when making eggs, but as you can use stainless as well. The trick to creating a better non-stick surface on stainless steel pans is to heat the pan first before adding any butter or oil. Once it is to temperature, add the fat and let it melt or heat up. Then add the food. You can use this method for anything you are cooking, not just eggs. I made these this morning with a dozen eggs! They were fabulous!! Just the perfect texture and so easy to make. Cracking all the eggs in the pan was not a problem either. I’ll try this recipe for breakfast. It looks delicious! I’m a reasonable cook, but I’ve always made grey, rubbery scrambled eggs and it’s annoyed me for ages. I just tried them like this and, voila, they turned out perfectly, as promised. Thank you so much!